The STOL CH 701 is based on vast design experience gained by aeronautical engineer Chris Heintz to provide the best in performance, cost, reliability and ease of construction. With form following function, the STOL CH 701 looks like the S.T.O.L. (short take-off and landing) off-airport plane it is designed to be. Not designed to be just another pretty aircraft, the STOL CH 701 was developed to provide maximum short-field performance while being easy to build and maintain, making in a true sport utility kit aircraft. "The two-place STOL CH 701 has been a success story largely unnoticed in the U.S.," wrote EAA Sport Aviation magazine. "More than 400 have been completed worldwide but only 100 of them have emerged from homebuilder's shops in the U.S. Usually that ratio would be reversed, but the real world use of the airplane has dictated otherwise. A significant number of those being used in Africa and other under-developed areas of the world rarely or never see a paved runway... or any sort of formal runway, for that matter." The modern STOL CH 701 design makes use of advanced technologies, while using proven design concepts and simple systems for easy assembly and maintenance. A professional design, the STOL CH 701's structure has undergone a complete and rigorous flight test and design stress analysis. Developed for the inexperienced first-time builder and demanding recreational pilot, the STOL CH 701 is designed to be easy to build and to maximize flight performance and efficiency. Simple systems, modern materials, and design ingenuity minimize required maintenance, and make the STOL CH 701 easy to build and fly, affordable, and very durable. WING DESIGN: The STOL CH 701 uses a special airfoil design to achieve very high lift, low stall speeds, and high strength. A thick wing, full-length leading-edge slats and trailing edge Junker type flaperons develop a maximum wing lift coefficient of 3.10, while maintaining a short wing-span of 27 feet. The flaperons act as both full-span ailerons as well as full-span flaps. For maximum reliability and to keep construction simple, the leading edge slats are engineered to remain in a fixed position in all flight attitudes, and do not retract. Click Here for details about the STOL CH 701 wing design. TAIL DESIGN: The STOL CH 701 has an all-moving rudder tail section to provide effective and responsive rudder control, especially at low speeds. The horizontal tail features a unique inverted stabilizer to achieve adequate negative lift for sustained high angle of attack climb attitudes. Click Here for details about the STOL CH 701 tail design. The STOL CH 701's large effective control surfaces provide excellent controllability at very low flying speeds - a necessity for effective short take-off and landing performance - while being very light and balanced. Control System: The control system is developed for ease of operation and simplicity, as well as low maintenance: There are no moving parts inside the wings, and controls systems are easily accessed through a large service door on the bottom of the fuselage. Aileron: Flaperon system; push-pull rods from flaperon mixer assembly, easy disconnect for wing removal. Flaps: Flaperon system (control mixer); push-pull rods, easy disconnect for wing removal. Mechanical lever located on floor, pilots side. Elevator: Control cables to elevator control horns. Rudder: Control cables from rudder pedals to rudder control horn. Steering: Direct linkage from dual rudder pedals to nosegear strut (hydraulic disk brakes on main gear wheels with individual toe-brake pedals on pilots side). The standard fuel system is made up of dual wing tanks located inside the wings behind the wing spars. Each welded aluminum fuel tank has a capacity of 10 US gallons, for a total capacity of 20 gallons. VISIBILITY: Unlike other high-wing designs, the STOL CH 701's wings are positioned above the cabin and fuselage to provide the pilot and passenger with superior visibility. 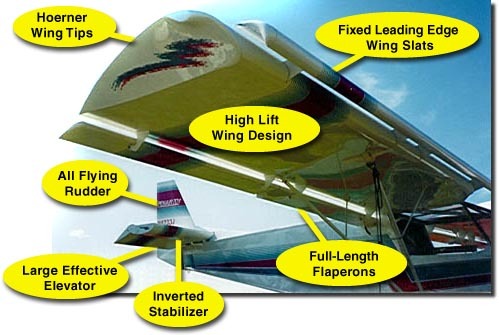 The 'above cab' wings taper at the wing root to maximize upward visibility, as shown on diagram. Click Here for details about the STOL CH 701 cabin. LANDING GEAR: The stock tricycle gear system used on the STOL CH 701 has outstanding shock absorbing capability for rough field operation. While tailwheel aircraft have traditionally dominated in off-airport applications, the STOL CH 701's tricycle gear offers rough field capability while providing all the advantages of a tricycle-gear aircraft, such as easy ground handling, superior visibility, and lower insurance rates. 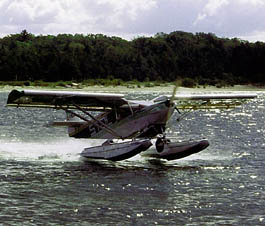 FLOATS: ZenairTM all-metal floats are ideal for use on the STOL CH 701, and may easily be rigged to the aircraft. The floats are mounted on a monoleaf main spring for retained shock absorption on water. New amphibious floats offer capability to operate from both land and water: The amphibious floats feature retractable main wheels (pneumatically activated), and a unique retractable single steerable nosewheel. The airframe itself is designed to allow maximum customization by the actual builder. The STOL CH 701 is not designed around a specific engine, allowing for custom powerplant installations by builders. However, the proven Rotax 912 engine is highly recommended, and is available as a firewall-forward kit. Click Here for details about engines. Throughout, the STOL CH 701 aircraft is designed to optimize STOL performance and to provide excellent flight characteristics. However, the aircraft is also designed to be easy and quick to build, and to provide a durable airframe that is well-suited for its utility role. Finally, the STOL is also designed to be low-cost to build, to own and to operate. "Chris Heintz has done an exemplary job to make the Skyjeep safe and pleasant to fly."